If you’ve been following along on my story recently, you’ve probably heard that we are moving! My fiance and I have lived in Calgary, Alberta, for exactly three years and now it’s time to go home to Ontario. I am so unbelievably excited about the future and our road trip to get there. We decided to drive the scenic route through Northern Ontario and I’m looking forward to seeing the quieter corners of our country. The overlooked spots. Even though I’m writing this the day before we leave, by the time you read it we will probably be somewhere near Lake of the Woods. Camping when we feel like it, dirty feet from running around barefoot and evenings around the fire. You know I like my quiet moments and I feel like I’m going to find a few of them on this trip. Over June, I neglected my blog. I didn’t publish a single post because the first two weeks were full of client work, and the second two weeks were a scramble to line up the details for the big move. All that chaos inspired this post. Despite the excitement, to-do lists, and lack of sleep, I learned a few things. I finished Stephen Covey’s 7 Habits of Highly Effective People recently. What he says about change made a lot of sense when applied to my own life this past month. When we self identify with things—a place, a partner, a job title—we set ourselves up for struggle when faced with the challenge of change. If you self-identify as your position at work, but then you lose your job for unforeseen circumstances, you also lose your sense of self. If you self-identify with a specific location, never having left and never wanting to explore other places, you will likely have a difficult time moving if relocation is one day necessary. Luckily, I’ve spent quite a lot of time in the last few months evaluating my life, my beliefs, and those I choose to surround myself with. This experience, my recent read, and jumping on the opportunity my partner was given back in Ontario has all led to here. Now, what about you? 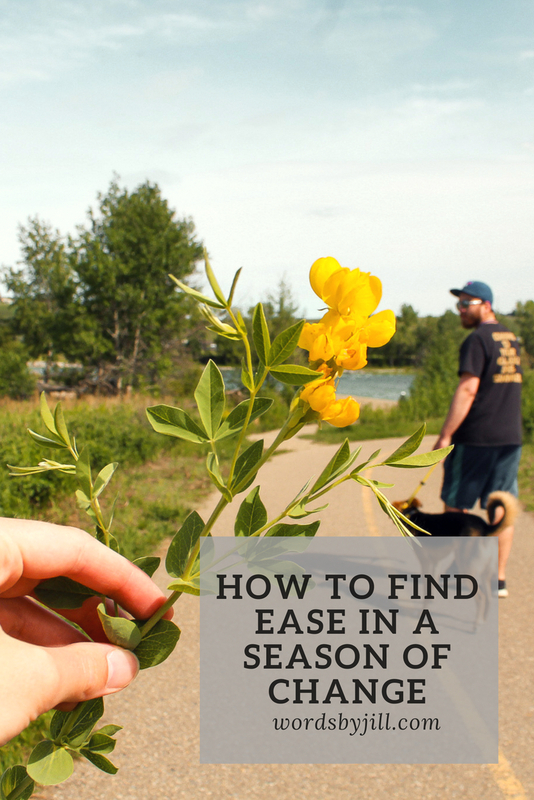 Here’s a few practices that helped me find ease in this season of change. What do you believe? It’s as simple as that. Your core values will guide you through changes without fragmenting your sense of self along the way. When your values are strong, they drive your daily movement. If your values are clear, they can do the same for you in times of significant change. Now, I don’t know everything that I believe in, but I’ve been actively trying to answer this question over months. It’s a slow process, but I promise you will find a calming sense of self along the way. In the book I just read, Stephen Covey suggests everyone writes a personal mission statement. I think this is a great idea too, although maybe it doesn’t need to be as formal as he makes the exercise sound. Your mission statement could be as simple as putting your core values to paper. You could take the time to write your wildest dreams, your long-term goals, your intentions for the day, month, or year. The act of actually writing these words on a page makes it feel so much more real. It creates consistency despite change. Find a positive habit that can act as stability through your season of change or take advantage of an old one you already love. Finally try something you’ve wanted to try for a long time. Learn a new skill, study a new topic. Try a new workout or just be more consistent with your workouts. I’ve dedicated more time to movement for myself: physically and mentally. I’ve stuck to my habit of scheduling multiple yoga classes into my weeks. I’ve also dedicated more time to reading and writing each morning for no one or purpose other than myself. It's as simple as looking forward to an activity you love doing around the same time each day. The structure does wonders. On the irregular days, you know you will have a chance to wind down by yourself. Sometimes all we need is a little time. A bit of space to accept change and re-centre ourselves in new surroundings. When you need time, it's better let your mind have it instead of feeling guilty. We are what we think, so we should think positively about ourselves. As for the challenge? Accept your weak spots. Strengthen them by leaning in to the challenge. The old sayings are usually true: That which doesn’t kill you makes you stronger, you know? Change doesn't have to be scary. We're guiding this cross-Canada move from a place of light and rest and ease, and I can tell you that makes all the difference. I'd love to hear from you. Are you moving through any significant changes in your life? How do you find ease through the process?